In the early 90s, PC gaming on IBM DOS-based computers was mostly left to things like simulation and strategy games. After all, if you wanted games, you would’ve bought yourself a Nintendo Entertainment System. That didn’t stop numerous companies from porting arcade and console titles, but a vast majority of the time, they were terrible. Even the antiquated Commodore 64 could produce substantially better games than the average 286 based game. They first took their game to Softdisk, a relatively large distributor of shareware. They were reluctant to publish it, since the smooth scrolling technique implemented by Carmack required EGA graphics, cutting out anyone who was stuck with a crappy old CGA system. However, Apogee, another shareware publishing giant, then having made a few games of their own, gave the team $2,000 to make a game using their engine for them to publish. 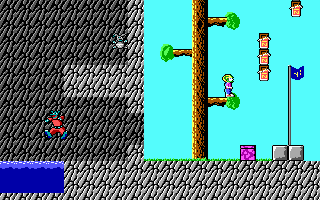 From this, Commander Keen was born. Commander Keen was the type of game that you would always find on your friend’s dad’s PC, buried beneath all of the usual boring business applications. Most PC games at the time were poorly animated messes, with choppy scrolling and terrible controls, but Commander Keen was about the closest you could get to console gaming on an IBM. 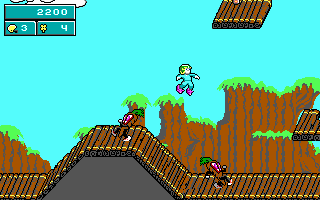 The hero, Commander Keen, is actually an eight year old boy with an IQ of 314 named Billy Blaze. (He’s meant to be the grandson of Billy Blazkowicz from Wolfenstein 3D. 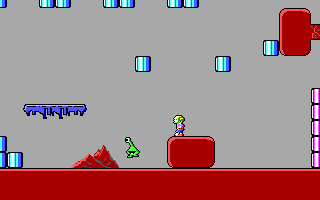 the next game id developed after Commander Keen.) Using common household objects like game joysticks and soup cans, he makes his own rocketship, and dons his brother’s football helmet to defend the Earth from threats. It’s a cute premise, sure enough, that borrows a lot of its cartoonishness from classic Warner Bros. shorts. 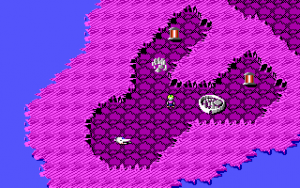 In each episode, you start the game from an overhead map screen, from which you travel to new levels. You can do them in any order you can reach them in, but you can’t pass the space they take up until you complete them. In later episodes, you’ll need special items like diving suits and grappling hooks to explore more of the map. 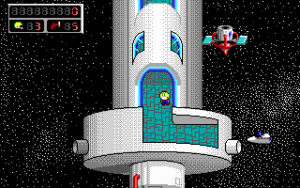 In each level, the goal is to find the exit, or sometimes a spaceship part or prisoner. You’ll collect keys to open locked doors, bonus items like candy and soda for points (if you get enough points, you get an extra life), and ray guns that increase your ammo stock. Keen can only take one hit before he dies, but not all enemies are lethal. He has a ray gun that’ll defeat most, but not all enemies, but it has limited ammunition. In the first episode, Keen finds a pogo stick, and he keeps this for the rest of the series. Hitting the pogo button will pull it out, and Keen will start bouncing on it. Holding down the jump button will let you make bigger and bigger bounces, much higher than you could on foot. He can’t shoot while on the pogo stick, though, and it can be pretty easy to bounce him right into a trap. Although it looks and feels like a console game, there are some pretty substantial differences from the normal Japanese developed platformers. 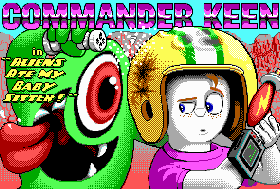 The game is designed to run with 16 color EGA graphics, which looked fantastic for the time, but have some odd palette choices, especially Keen’s ghostly white face. The levels themselves are rarely completely linear, left-to-right affairs, usually featuring large open areas with multi-directional scrolling. At least you can save your game between levels. 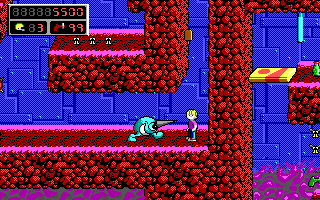 The Commander Keen games were distributed via the shareware model. For instance, the first episode was free and you were welcome to share it with your friends. If you registered, you would receive the next two episodes. Although they’re technically part of the same release, each episode has its own set of files and executables, so you can’t switch episodes without exiting to DOS. 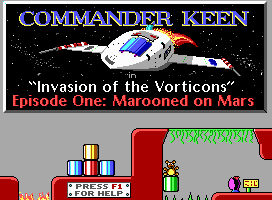 In Episode 1, Marooned on Mars, Keen is exploring on Mars, an alien race known as the Vorticons steal four key parts of his rocketship. 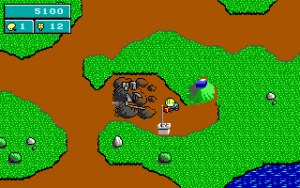 Keen has to explore the planet, fighting his way through the planet’s fortresses and cities. You don’t have to complete all the levels, and if you find all four parts, you instantly win the game. In Episode 3, Keen Must Die!, you travel to the Vorticon’s home world in search of the Grand Intellect. You’ll have to contend with Vorticon children and their toys, not to mention their mothers. This episode has an ankh power-up, giving Keen temporary invincibility. Keen eventually discovers that the Grand Intellect is actually Mortimer McGuire, a boy from his school who bullies him because of the one IQ point he has over Keen. After the final battle, he frees the Vorticons and returns to Earth. 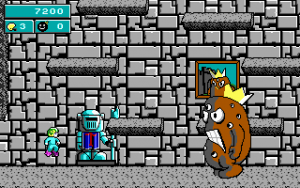 The graphics lack the personality the later games have, with small sprites and gray walls for backgrounds. The controls aren’t as tight as the later games either, with it taking a second for Keen to start and stop moving. Ammunition is a lot harder to find than in the later episodes, so you’ll often have to run away from enemies. One of the game’s biggest flaws is its sound. All the sound in the game comes through the speaker in your PC, and it can very annoying quickly. There’s a constant rumbling sound when Keen moves, and a squeal when he falls from a platform. Another annoyance is that there’s no HUD like in the later episodes. To see your score, number of lives, and inventory, you have to press the space bar to bring up a status screen. The alien race in the game, the Vorticons, actually have their own alphabet. All the signs in the game are in the Vorticon language. In episode 3, in a school house, you can actually find how the letters in Vorticon translate to the English alphabet, letting you decode the signs you find in the other episodes. Commander Keens‘s creators had gone to form their own company, id Software, but were under contract by Softdisk to make a few more games for them, since they were technically employed by them while developing the Commander Keen games. 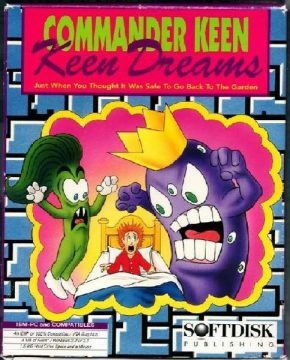 One of these was Keen Dreams, which was released in full as shareware. If you registered, you would get several other “lost” id games, including Hovertank 3-D, Catacombs 3-D, Rescue Rover, and a handful of others. In this episode, after an argument with his parents about eating his vegetables, Keen is sent to bed without dinner. He has a bad dream about him waking up in a land ruled by vegetables that want to kill him. After defeating the vegetables’ leader, Boobus Toober, Keen wakes up with a new found appreciation for greens. Keen Dreams uses a new, vastly improved engine. There are now three different difficulty levels to choose from when starting the game. Keen also has a new ability that lets him climb up and slide down poles in the environment. He can also now drop through semi-solid platforms by hitting the jump button while ducking. A HUD is now visible on the top left of the screen, showing how many lives you have, your score, and your ammo. This HUD would be in the rest of the series, although the space bar brings up more detailed stats. In this game, Keen is missing use of his ray gun and pogo stick. There’s no replacement for the pogo, but Keen tosses Flower Power pellets at his enemies to temporarily transform them into flowers. He can also find Boobus Bombs that can only be used in the final battle to damage Boobus Toober. If you don’t have enough of these, and can’t get more, you’re doomed. The graphics are much better, with bigger, more detailed sprites and backgrounds. Keen wears blue pajamas and pink bunny slippers along with his Packers helmet. There’s a slanted 3D look to the levels that the rest of the series would use. The PC speaker sound effects are a little less annoying, and there’s an option to use the Adlib card for sound. There’s still no music, unfortunately. 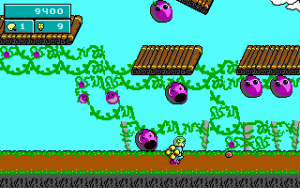 In 2013, Super Fighter Team published Keen Dreams for Android devices. 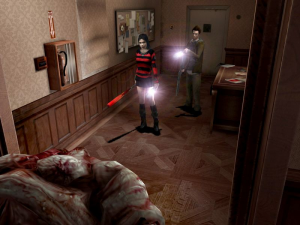 Episode 4 and 5 are considered by many Keens fans to be the best in the series. 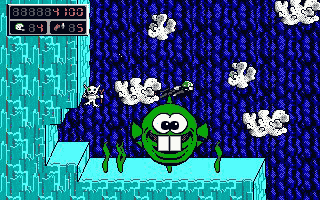 It uses a further modified version of the Keen Dreams engine, with the new ability for Keen to hang onto ledges and pull himself up. The pogo stick and the ray gun (which now only stuns enemies) also return, although the Flower Pellets are gone. There’s a full music soundtrack this time, although only a couple of songs are really memorable. The map screen’s been expanded, with special items needed to explore further. There’s also a new way to earn extra lives besides points. If you find 100 of a certain object (drops of Lifewater in Episode 4, jars of Vitalin, or life giving bugs known as Vivas), you’ll get an extra life, console-style. 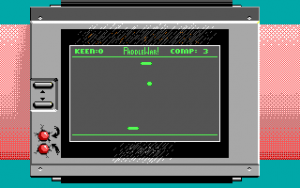 Keen now wears a special watch that acts as an option menu, and also includes a Pong-style minigame called Paddle War. Episodes 4, 5 and 6 also had CGA versions produced, as Carmack had apparently overcome the technology limitation imposed by the early games. In episode 4, Secret of the Oracle, Keen uses a faster-than-light radio to discover an evil plot by an alien race, known as the Shikadi, to destroy the galaxy. He travels to the planet Gnosticus IV to get the advice of the oracle there, but learn that the eight elders have been kidnapped and imprisoned. 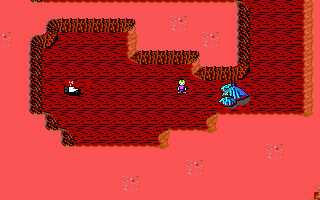 It’s in this episode that Keen meets the legendary Dopefish. The Dopefish only has one thought in his head at all times: “Swim, swim, hungry”. When he sees Keen, he’ll swim off after him, trying to chomp him. 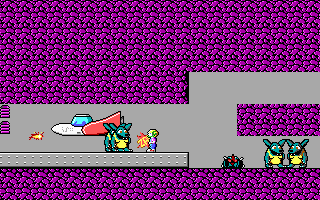 His only other appearance is in GBC Commander Keen, as a minor enemy and a drawing on a wall. 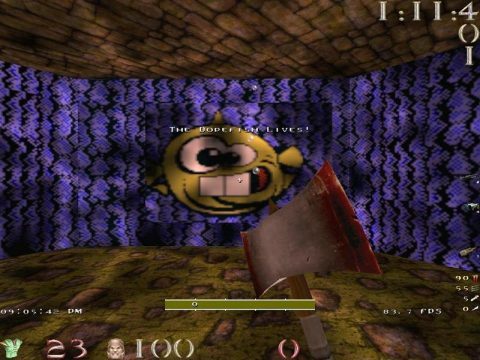 He garnered a cult following, though, appearing in loads of other games like Quake, and even showed up in a few that had nothing to do with id or Apogee, like Jazz Jackrabbit 2, Hitman 2, Max Payne 2, and Descent 3. 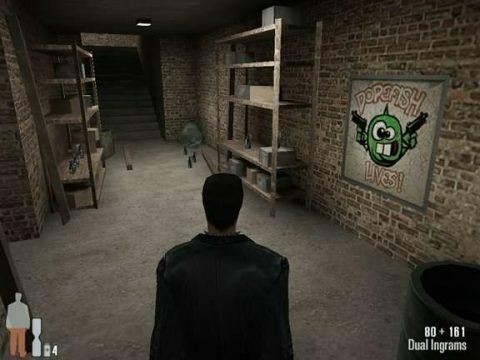 Although he didn’t make an appearance in either, the words “Dopefish Lives” can be seen in both Rise of the Triad and Duke Nukem 3D. Episode 4 was released as shareware. In Episode 5, The Armageddon Machine, after freeing the elders, they tell Keen that the Shikadi plan on using their space station, the Omegamatic, to destroy the galaxy. After destroying its core, he learns that the Mortimer he defeated back in Episode 3 was only an android, and the real one escaped to rule the Shikadi. 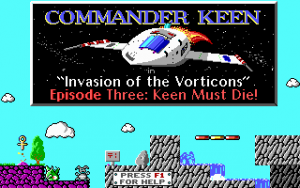 This episode was published commercially by FormGen, who also published Spear of Destiny, a sequel to Wolfenstein 3D. It uses the same engine that Episode 4 and 5 used, with no new improvements. 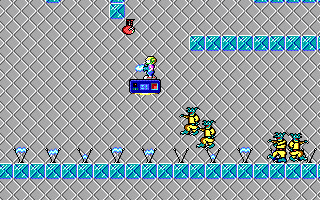 It’s also the final canon Commander Keen game. After the destruction of the Omegamatic, the Grand Intellect’s plan to destroy the entire universe is revealed. He has the Bloogs kindap Keen’s babysitter Molly, and Keen has to go to their homeworld, Fribbulus Xax, to get her back. There’s nothing particularly new or innovative about this one – it’s basically just a new set of levels. There were plans to make another Commander Keen episode, called The Universe Is Toast!, but id became too busy with the development of Wolfenstein 3D and Doom. It ended up being cancelled. This Keen game was made in 2001 by Harebrained Schemes, the same people behind the epicly awful Earthworm Jim GBC game. 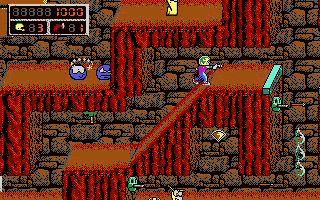 It’s been pretty much disowned by the Commander Keen fandom, and Tom Hall himself says he doesn’t declare it canon by any means. In it, Keen must travel through three different planets to find crystals and stop the Grand Intellect’s latest plot. These planets include locations from older Commander Keen games, including Fribbulus Xax, the Shikadi homeworld, and Droidiccus Prime. However, the levels are all new. This entry, while it has the same basic gameplay of the other Keen games, actually plays a little bit differently than the classic games. The game uses the expanded pallete of the GBC to improve the graphics, with Keen getting a normal skin color and a red shirt. 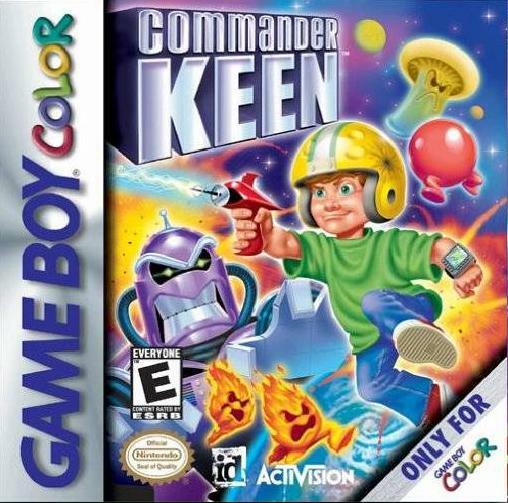 Oddly, though, the ray gun and the pogo stick Keen carries use the same color as Keen’s skin, which makes the way Keen holds the pogo between his legs look… disturbing. The game, for the most part, plays all right. 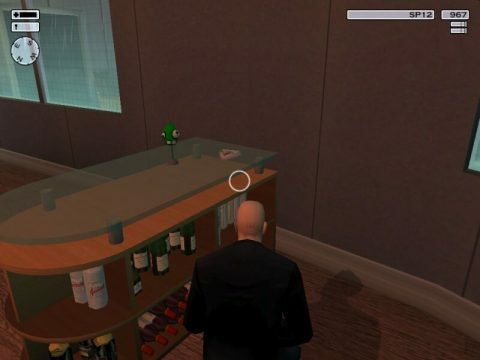 You still pick up candy and junk food for bonus points, and search for keycards to open doors. The ray gun now has unlimited shots, but you have to pogo on enemies after you shoot them to finish them off. The pogo stick also returns, but it controls a lot better in this game, which more nostalgic fans may think is a minus. Keen can take two hits now, but there’s no way to see how many hits you have. One of the problems with this game is that the levels are very large. This, combined with the small screen of the Game Boy Color, can make finding your way around difficult, and makes avoiding enemies harder. Another thing is that the game loses the quicksave system the PC games used for the password system almost all third-party Game Boy games used. While the quicksave system could easily be abused, it did make the PC games a lot easier. GBC Keen isn’t really a bad game, but it doesn’t quite reach the level of the other games in the series. Not only that, but it kind of pales in comparison to the other platformers on the GBC. The changes to the game make it a tad more fun, but it’s really the GBC limitation’s that drag it down. 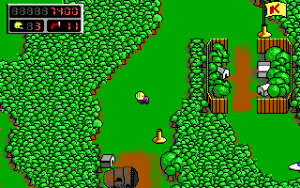 After the release of Episode 6, id mostly forgot about Commander Keen. 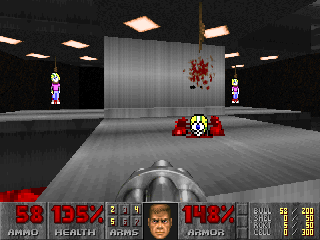 He appeared in Doom II at the end of a secret level, being hung. If the player shoots him, he’ll fall apart into a bloody mess, complete with PC-speaker sound effects. 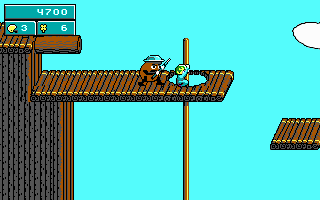 He made several less violent appearances in Apogee games. He was frequently on their high-score tables, and was a hostage in Bio Menace. 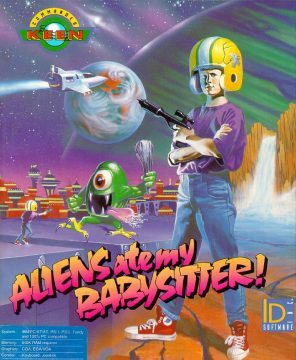 The Commander Keen series, although they definately had their flaws, gave people who didn’t have consoles the same experience. His successor is Epic’s Jazz Jackrabbit, another series of console-style platformers, that were also distributed via shareware. 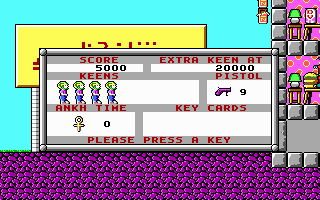 Most importantly, the Commander Keen series gave id the money they needed to make Wolfenstein 3Dand Doom. Many of the people who worked on Commander Keen, like John Carmack and John Romero, got big breaks in the gaming business. 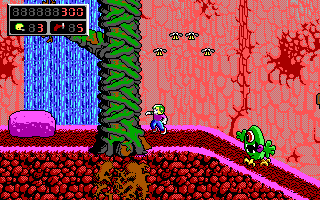 Without Commander Keen, PC gaming wouldn’t be nearly as popular as it would be today. Dopefish Lives The official fan site of the Dopefish. 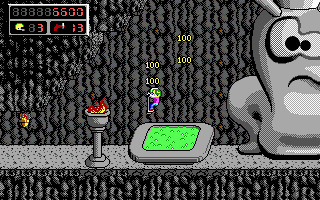 DOS Classics Includes a shrine to Commander Keen. 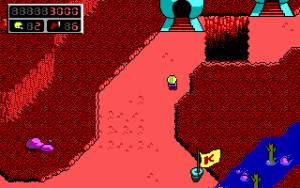 Eurogamer – Commander Keen GBC Review Review of the latest Commander Keen game. 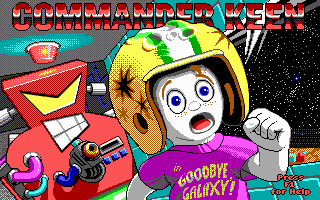 Commander Keen.com Another fan site. Easter Eggs.com Dopefish pictures mostly courtesy of here. 3DRealms – The History of Commander Keen An official history, complete with quotes from the developers.